What's with all the movement inside my Pro 100 before printing? Discussion in 'Canon InkJet Printers' started by avolanche, Apr 2, 2019. Avalanche, the fact that the “action, movement” you notice occurs “before a print" is a good sign that the activity is a cleaning cycle. The duration of a cleaning cycle is typically 60s and uses a bit more than 0.22ml per cartridge (on average) or a total of 1.8ml across all 8 carts. As others have pointed out you cannot stop these cleaning actions, but it is very useful to understand them, particularly if you use OEM ink, where you want to minimise waste ink. There is a very simple test you can perform to confirm the activity is a cleaning cycle. Next time you observe the activity, take note of the time and date. Every time you print for the next 5 days check that the activity does not precede the print. After 119 hours and 45 min (that’s 15 min short of 5 days) send a nozzle test to the printer. Half an hour later send another nozzle test to the printer. If you have not removed any ink cartridges or had a power failure during the 5 days then the only time you should get the cleaning activity (before a print) will be with the last nozzle test and not with the one half an hour earlier. With the Pro 100, cleaning cycles are controlled by a 120 hour timer, which is started following the last cleaning cycle. Expiry of the timer results in the next cleaning cycle with the first print that follows the timer expiry. 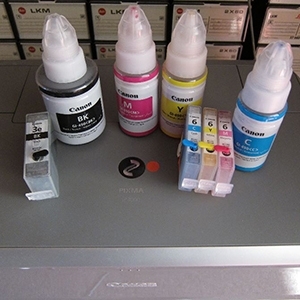 There is also a longer timer which will result in a larger purge of ink (double) if the printer is not used for a long time (20 days). A manual clean will reset the timers. There is no 60 hour timer on a Pro 100. There are other times you will hear activity, movement, typically after a print. These activities tend to use significantly less ink. Avalanche, the fact that the “action, movement” you notice occurs “before a print" is a good sign that the activity is a cleaning cycle. The duration of a cleaning cycle is typically 60s and uses a bit more than 2.2ml per cartridge (on average) or a total of 1.8ml across all 8 carts. As others have pointed out you cannot stop these cleaning actions, but it is very useful to understand them, particularly if you use OEM ink, where you want to minimise waste ink. Thanks for the explanation. One question, you said "uses a bit more than 2.2ml per cartridge (on average) or a total of 1.8 ml across all 8 carts." Not sure that is what you meant.....or I'm not understanding. Is it 2.2ml x 8 = 17.6 ml? I don't think my printer has ever gone past the 120 hour mark without a print, so I must be hearing normal activity. One question, you said "uses a bit more than 2.2ml per cartridge (on average) or a total of 1.8 ml across all 8 carts." Not sure that is what you meant.....or I'm not understanding. Is it 2.2ml x 8 = 17.6 ml? Oooops. Sorry Avolanche, it should have read "O.22ml" not 2.2ml. I have corrected the original text. Just to be clear, I am not saying the printer will initiate a clean if you have not printed for 120 hours. What I am saying is that regardless of printing or not printing, as soon at the 120 hour timer expires a cleaning cycle will occur with the first print after the timer expires. If you did not do any prints for 480 hours then the purge will be twice as big with the first print that follows that timer expiry. As an example, if the printer initiated a cleaning cycle on Monday at 3PM, and you printed every day after that at 4PM, then the next cleaning cycle would be at 4PM on Saturday. However, if you did not do any printing after Monday until Sunday at 4PM then that is when the next cleaning cycle will occur. I understand the first print after the 120 or 480 hour mark. I print something about every 2 days, so I'll print something close to those times. I print something about every 2 days, so I'll print something close to those times. I am not sure what you mean. If you mean you will continue printing about every 2 days, then that would ensure your printer gets a good workout and the printhead is unlikely to clog. It also means the 480 hour timer will never expire, since it will be reset when the 120 hour clean takes place, and hence you will not waste ink as a result. Yes, exactly what I meant to say...........that I'm unlikely to hit the 480 hour mark and waste ink.